When I was serving a rural parish in Saskatchewan a few decades ago, I chose a communion Sunday to explain the meaning of communion to the children. Little did I know the surprise that awaited all of us. A white cloth covered the whole communion table, including the plates of bread cubes and the stack of trays with little glasses (remember those days?). I asked the children what they thought was under the cloth. One immediately piped up, “A body?” Sort of, I replied. I then explained about the bread and the juice representing Jesus’ body and blood. We even talked about the colour of the juice and then I lifted the cloth. To my amazement, the juice was yellow. With my stumbling words, I told the children that the juice was usually red. I assumed that someone had mistakenly bought white grape juice and I had to make a quick mental adjustment. Later, when everyone had glasses in hand, we drank together. Eyes popped open, accompanied by sputters as we all realized that we had just drunk grapefruit juice. Apparently the person buying the juice hadn’t noticed the word fruit on the end of the grape and was too—dare I say Scottish?—to buy another bottle after discovering his mistake. I have been asked by the Worship Team to explain the meaning of communion for today’s service—hopefully without incident this time! Various denominations have different interpretations of what it means and different names: Communion, the Eucharist, the Mass, the Lord’s Supper. At one end of the spectrum, the Baptists believe that the Lord’s Supper is an ordinance, not a sacrament, and is simply a memorial meal to remind us that Jesus gave his life for us. The bread and the juice do not change substance, nor are they embued with any extra meaning. At the other end of the spectrum, the Roman Catholic Church believes in transubstantiation, which means that the bread and the wine become the actual body and blood of Christ when the priest lifts up the elements and says the words of institution: “this is my body” and “this is my blood”. Often a bell rings to indicate the change of substance. Last Christmas Eve, I was startled in the middle of our late service. Immediately after I said the words of institution, and a soft bell began to ring. Did anyone else hear that? I had to shake my head a few times to continue. The United Church was more Presbyterian than Methodist in its earlier celebration of communion, because most United Churches only celebrated it quarterly, according to Presbyterian tradition, after elders had visited everyone and given them a token or a card indicating that they were spiritually prepared to receive communion. It was a sombre and reflective occasion, patterned after the passage we heard from I Corinthians. Every person was expected to examine themselves and confess anything that separated them from God’s love before coming to the table. But our table has never been reserved for the pure of heart. If so, it would be closed to all of us. Rather, our table has always welcomed the forgiven. Eventually the liturgical movement led us to celebrate communion more frequently, bringing us closer to our Methodist ancestors who celebrated communion weekly, sometimes daily, based on their Anglican heritage. Most United Churches now celebrate communion monthly—and usually on the first Sunday of the month. We no longer have elder visitations or cards to bring, but at Westworth, our communion services are still a bit more formal and reflective than other services, to help us prepare for communion. The church’s practice of communion originated with Jesus’ celebration of the Jewish Passover meal with his disciples—the last supper that he would share with them before his death. The Passover meal is full of symbolism, including the sacrificial paschal lamb, which was eaten on the eve of the Passover celebration. 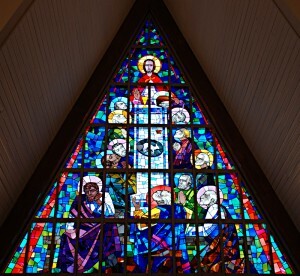 I direct your attention to our Leo Mol stained glass window, which depicts the last supper, with the Paschal Lamb in the middle of the table. There is another object on the table, which we would assume is bread, but looks an awfully lot like a muffin. When Leo Mol was asked about this, he smiled and answered, “It is a muffin.” Bread comes in many forms—and apparently includes muffins. 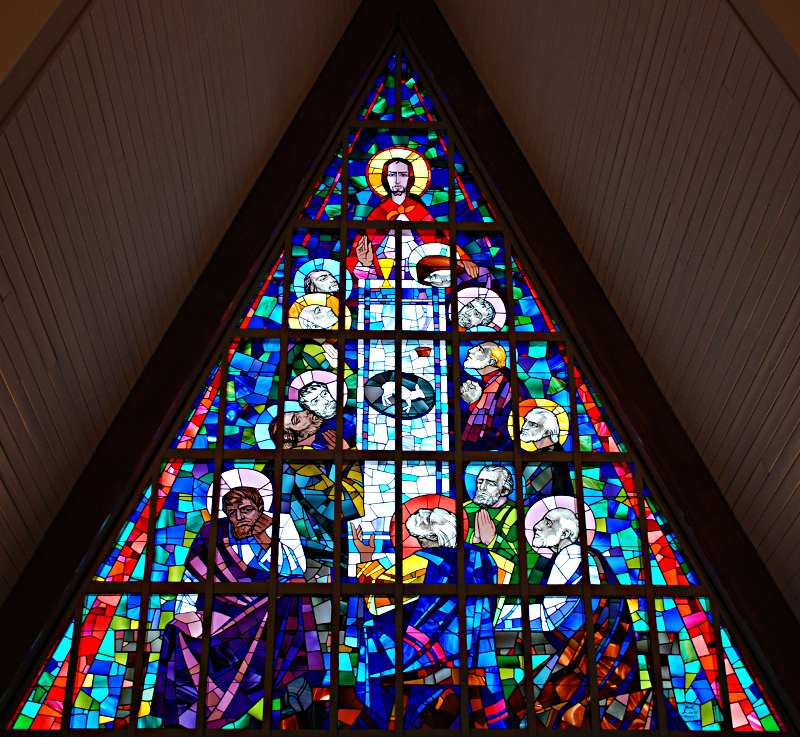 Leo Mol was invited by Westworth to design a stained glass window for this triangular space. He was fascinated by the challenge of the isosceles triangle and sketched a number of biblical scenes for our consideration, including the Holy Spirit coming down at Pentecost, the Resurrection—even the Blessed Virgin Mary! Sketches of each of these may still be available to view in his former studio in the Leo Mol sculpture garden. Westworth chose the Last Supper, which Leo Mol creatively adapted from Leonardo da Vinci’s Last Supper. da Vinci’s painting captures the reaction of the disciples at the moment of Jesus’ declaration that one of them would betray him. Similarly, Leo Mol depicts the disciples’ response in his stained glass. While you may think that the shadowed face turned away from Jesus in the lower left is Judas, Leo Mol suggested that there may be other possibilities. As we prepare ourselves to receive communion today, I invite you to reflect on the faces seated around Jesus. Which face resonates with you and why? Is it the face turned away that cannot bear to look at the pained face of Jesus? Is it the young face of John, who seems to be sleeping peacefully, comforted by Jesus’ hand? Is it the disciple at Jesus’ right hand, who reflects the same pained expression of Jesus as he considers the implication of Jesus’ pronouncement? Is it the disciple whispering words of warning or perhaps speculation into the ears of another? Is it this other, who allows himself to be drawn in to these whispered rumours? Is it the enlightened face, yearning to catch every nuance of what Jesus is saying with clasped hands? Or is it the face of the man with eyes closed, praying that he not be the betrayer? Is it the man at the center bottom, unable to grasp that any of them could betray Jesus? Or is it the one, looking resolutely ahead, aware that all of them are capable of betrayal? And finally, look again at Jesus. Even after giving such an unbearable warning, Jesus’ right hand is raised in a blessing for each one of them—even for the betrayer. Ultimately, we have all betrayed Jesus at some time or other in our lives, but Christ still offers us forgiveness and a blessing of grace. This is the grace that is offered to each one of us as we remember him in the Celebration of the Sacrament of Holy Communion.